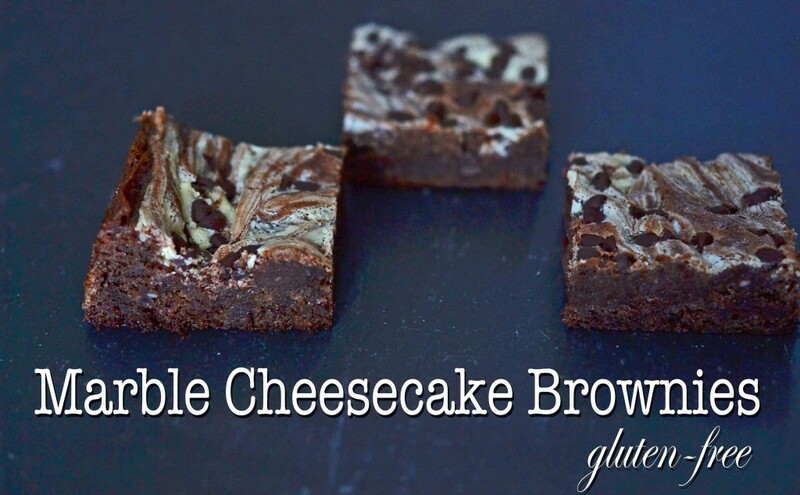 Marble Cheesecake Brownies | Great gluten free recipes for every occasion. I saw Paul McCartney on Saturday. At the movies. Sir Paul McCartney to you (and me). He was with Stella and her kids. He’s thin as a rail, and had gray hair, was wearing a hat. I giggled like a schoolgirl. I tried to take a picture with my iPhone. Of him walking away (clearly). It was the blurriest iPhone picture any grown human person has ever taken in the history of the iPhone world. He did not see me. If he had seen me and my moneysaving self, I’m pretty sure he has x-ray vision and would have seen right through me to the other side of me if there had been something important there. The rich (and the knighted) are just different. And that’s a fact. I wonder if Sir Paul is Gluten-Free-Curious (what? remember Gwyneth). I bet Stella and Gwynnie are thick as thieves, too. And that they pretend to bake gluten-free together and then just eat the made-for-TV GF food that other people make for them and hide on the made-for-TV shelves underneath the countertops in their made-for-TV kitchens. In London. But you and I both know that there’s just no way they’d eat brownies. At least not while anyone else was looking. 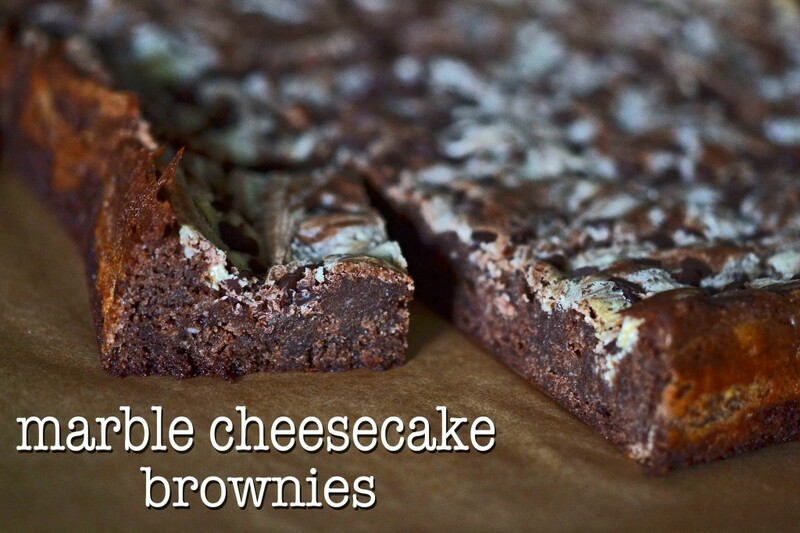 These are not your average cheesecake brownies. I just want that settled straight away up front and center. The cheesecake portion is mixed into the brownie portion, but loosely. So that it is still swirled a little bit, but the brownie part is kind of, well, cheesecake flavored. And then the brownies are not overwhelming and are even smoother than you’ve ever known brownies to be. To make sure they’re nicely swirled, and to lend a certain something extra, a bit of melted white chocolate is dolloped on top, and then swirled with a butter knife. It’s pretty. Don’t you think? Sprinkle a few mini chips on top, and bake low and slow (325 degrees F for about 30 minutes, give or take). There’s a little bit of bowl accumulation involved in making these brownies, but they’re not at all complicated. I bet even Stella would share one with Paul (and the kids). Everything in moderation, Sir. Preheat your oven to 325 degrees F. Grease and line a 9-inch square baking pan, and line it with one sheet of unbleached parchment paper that overhangs two opposite sides of the pan. Grease the parchment paper and line with another sheet of parchment paper that overhangs the other two sides of the pan. Set the pan aside. In a large bowl, place the flour, xanthan gum, cocoa powder, baking powder, 1/2 teaspoon kosher salt and 1 cup sugar, and whisk to combine well. Add the butter, 1 egg + egg yolk, and 1 teaspoon vanilla. Mix to combine. 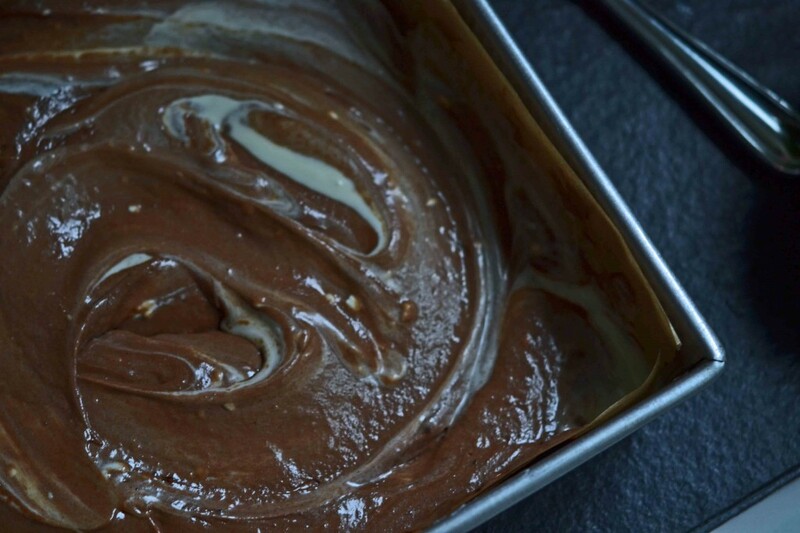 Scrape the brownie mixture into the prepared pan and smooth with a wet spatula. Set the pan aside. In the original large bowl, place the cream cheese, 1/2 cup sugar, remaining egg, 1/8 teaspoon kosher salt and 1 teaspoon vanilla extract. Mix until smooth. 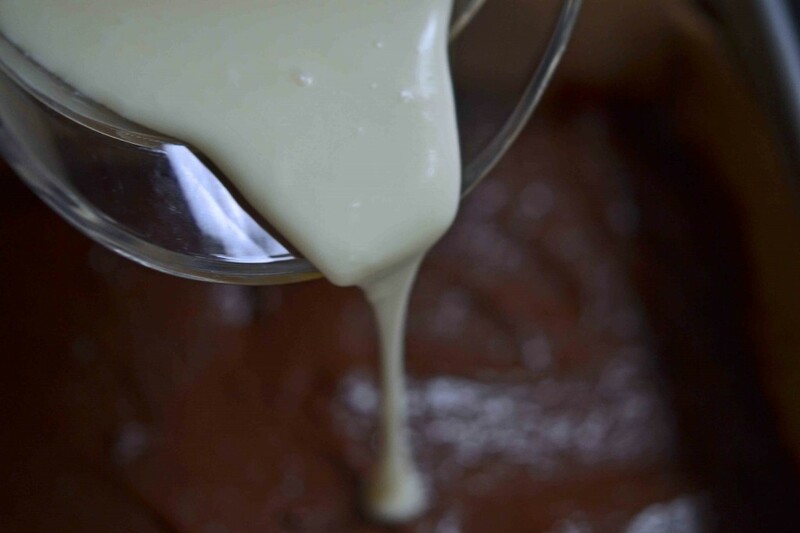 Pour the cream cheese mixture on top of the brownie layer in the pan. Mix gently until mostly combined, with a few pale streaks remaining. Shake into an even layer in the pan. Place the white chocolate in a small, microwave-safe bowl, and microwave for 45 seconds at 60% power. Mix, and then microwave again for 45 seconds at 60% power. 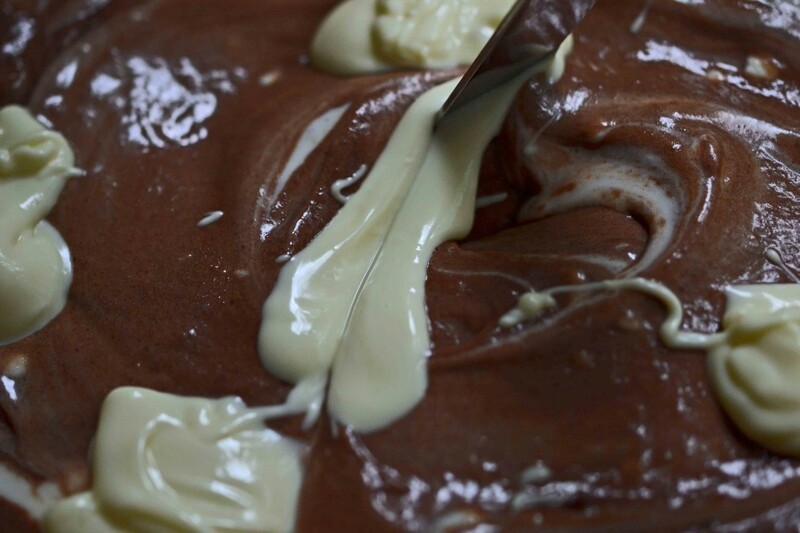 Mix until the chocolate is melted and smooth. Place the melted white chocolate on top of the batter in dollops, and swirl gently with a butter knife. 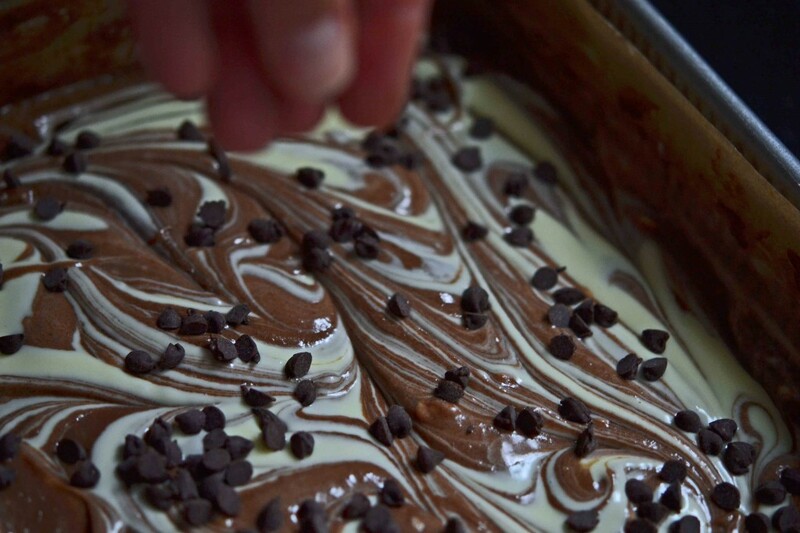 Sprinkle the mini chocolate chips evenly on top of the batter. Place the baking pan in the center of the preheated oven and bake, rotating once during baking, until a toothpick inserted in the center comes out mostly clean (about 30 minutes). It is better to underbake than to overbake. Remove from the oven and allow to cool in the pan for 10 minutes. Place the pan in the freezer for 15 minutes or until firm. Remove the brownies from pan with the overhung parchment paper. Slice with a sharp, clean and wet knife into 16 pieces. P.S. If you haven’t yet, please pick up a copy of My Cookbook. I really appreciate your support, more than you know! I made these brownies for a family gathering, and everyone raved about them! No one could believe they were gluten free, in fact they didn’t believe me when I told them they were. I also tried the no-bake brownies last week but subbed out the chocolate cookie crumbs for peanut butter and they were very yummy as well. Thanks for the (no) baking inspiration and recipes! Nicole, the one thing I’ve missed the most being GF is good brownies and cream cheese marble brownies were my absolute favorite. I’m SO glad you came up with this! My problem now is that they used to be my favorite, thanks to (like Taylre) the wonderful ways you find to fatten me up! Ok, I lie, it’s all under control, but goodness, it’s not for lack of a good effort on your part! :). Thanks for all you do! These look epic!!! O.O I must eat. Chocolate and cream cheese are right up there with chocolate and peanutbutter! These look soooooo good! Aw, Sara, shucks! You say that now, but perhaps you have forgotten that he has heaps of money. ;) For the record, I’d like to see you out and about, too! I agree, Sara. I enjoy watching Sr Paul make music but our own GF heroine Nicole brings so much more to the table!! !